Pineapple Teriyaki Pork Kabobs - Salty, Sweet, and Scrumptious! 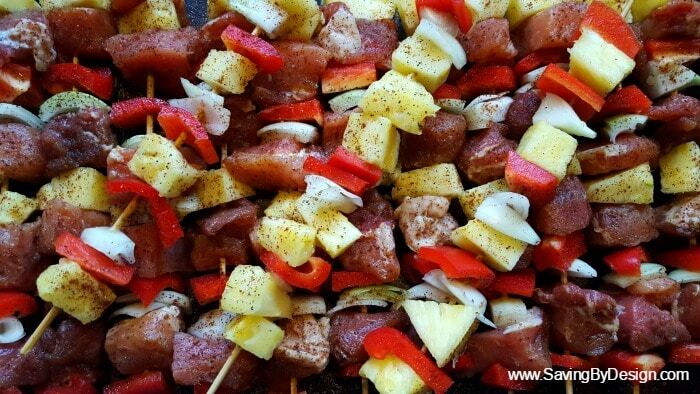 You are here: Home / FOOD / Recipes / Pineapple Teriyaki Pork Kabobs – Salty, Sweet, and Scrumptious! Pineapple Teriyaki Pork Kabobs – Salty, Sweet, and Scrumptious! 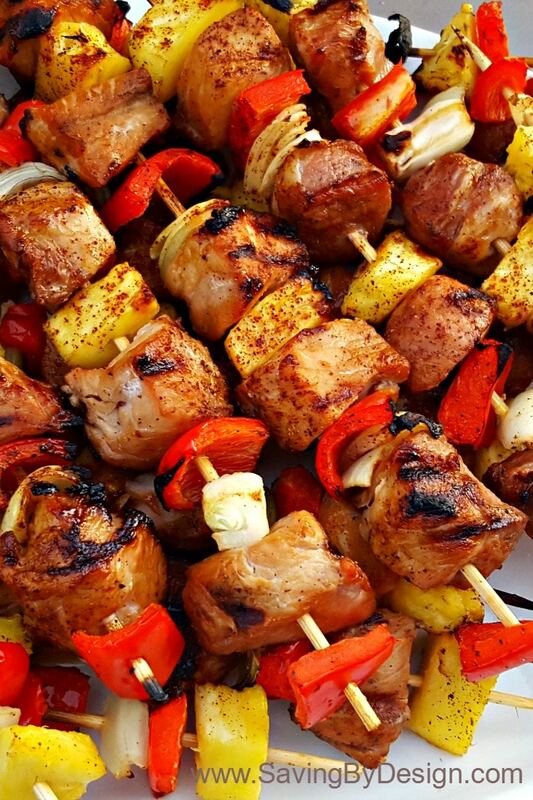 I just can’t get enough of these pineapple teriyaki pork kabobs! 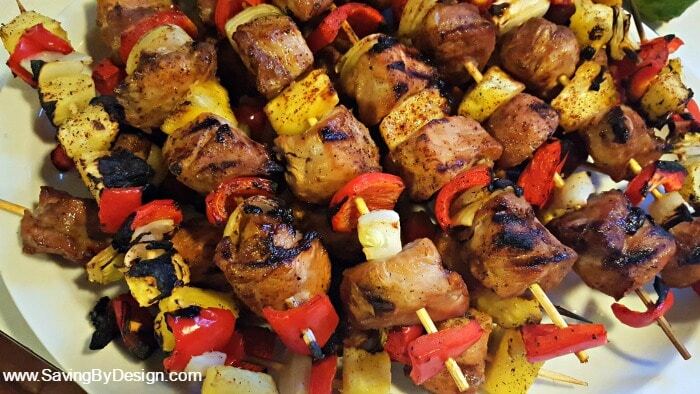 These sweet, salty, and scrumptious kabobs are perfect for your next summer barbecue! 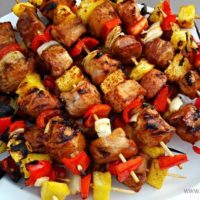 When we started making these pineapple teriyaki pork kabobs a few years ago I just couldn’t get enough of them! They almost instantly jumped to the top of my favorites list! Yes, I might even choose them over my once or twice per year lobster tail! They are THAT GOOD! I am a complete sucker for food. There are quite a few foods that I would consider my favorite – lobster (obviously you can’t ever have enough lobster in your life! ), steak, french fries, funnel cakes…good thing I don’t have my favorites very often, huh?! There’s just something about the salty & sweet combo of these Pineapple Teriyaki Pork Kabobs that gets me every time. Oh, add chocolate covered pretzels to that favorites list too! Salty teriyaki sauce, sweet pineapple, crisp onions and red peppers, and super tender pork…now that’s what a great kabob is made of! Making these pineapple teriyaki pork kabobs really isn’t difficult. It takes a little time to get everything skewered, but other than that, easy peasy! I love using boneless country style ribs for my pork kabobs. Just cut across each strip of meat a few times and you have the perfect kabob portions. 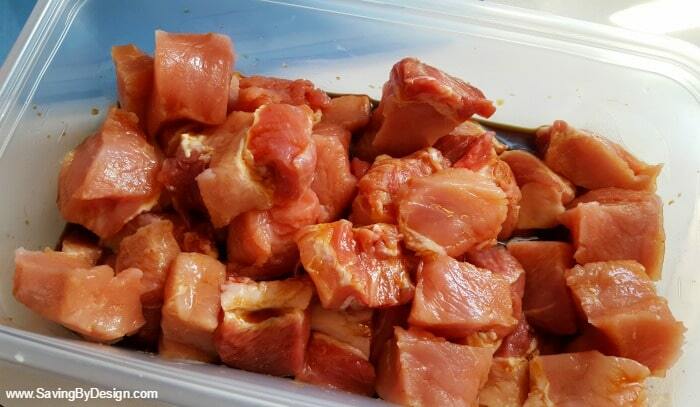 The first thing you need to do is get your pork marinating. I’ve marinated it overnight, and sometimes just a few hours. Either way will be delicious. 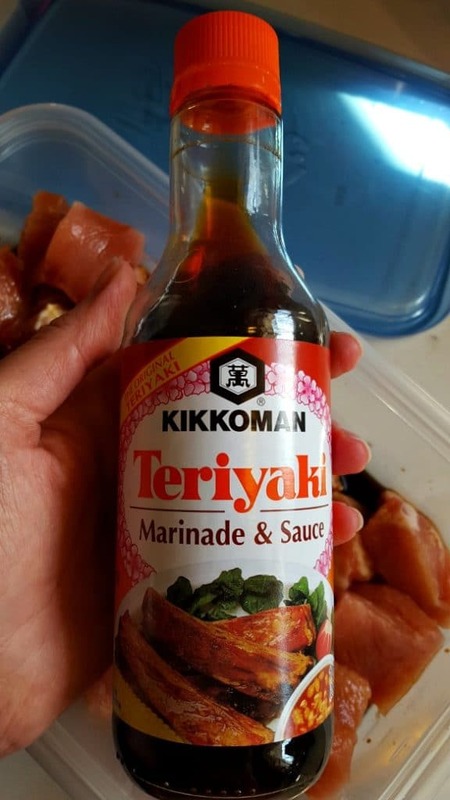 I know there are many teriyaki marinades out there, but honestly the only one I’ve ever used is the Kikkoman Teriyaki Sauce & Marinade. If it’s not broke, don’t fix it right? After that it’s time to assemble your kabobs. I cut up chunks of red peppers, onions, and pineapple. If it’s on sale I love using a fresh pineapple, but if not canned pineapple chunks work just as good. Once your skewers are complete season the pork kabobs with a little salt, pepper, garlic powder, and chili powder. Throw them on the grill for about 15 minutes or until pork is cooked all the way through and wah-lah! You have a super delicious and refreshing summer entree! Make sure when eating your bites include some pork and veggies together to get the full effect…you are going to LOVE these!! Salty teriyaki sauce, sweet pineapple, crisp onions and red peppers, and super tender pork…now that’s what these great Pineapple Teriyaki Pork Kabobs are made of! Cut the boneless spareribs into pieces to skewer. Marinade pork pieces in teriyaki sauce for at least a few hours to overnight. 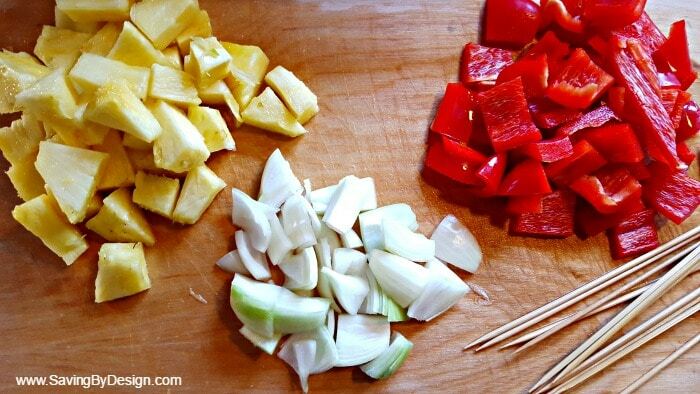 Cut red peppers, onions, and pineapple into pieces to be skewered. Fill skewers by alternating pork and veggies. Season skewers with salt, pepper, garlic powder, and chili powder. Grill for about 15 minutes or until pork is cooked all the way through. This depends on the size of the pieces of meat used. Such a wonderful summer recipe! 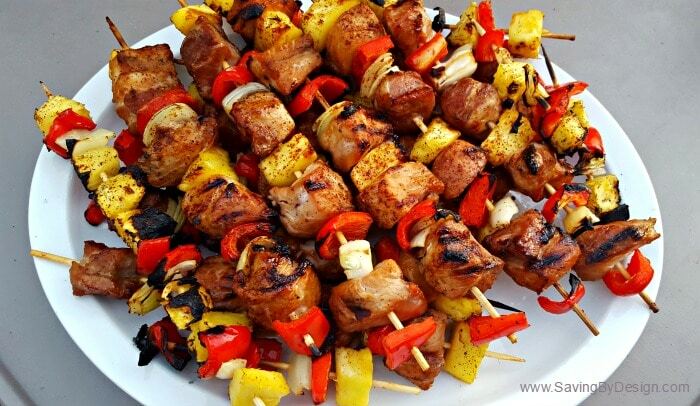 These kabobs are absolutely DELICIOUS! !